Theodore Karasik, writing in Al-Arabiya raises questions about Field Marshall Khalifa Haftar’s anticipated offensive against the Libyan capital, Tripoli. While Karasik is spot on, let me add some additional context to the Libyan army commander’s position and consequences in Libya today. Haftar leads the Libyan National Army (LNA) in the east of the country and is a close ally of the Tobruk-based House of Representatives, a rival to the Tripoli-based Government of National Accord (GNA) which is on life support. Complicating matters is the General National Congress (GNC) which holds several Tripoli ministries. Haftar’s anticipated offensive was short-circuited for several reasons. First, Italy flipped sides against Haftar to get back at Egypt for the killing of Italian graduate student Giulio Regeni in September 2016 and its impact on Rome-Cairo relations. Rome was backing Cairo and Haftar up until recently. Italy was supporting Egypt with intelligence, surveillance, and reconnaissance information but apparently retreated when the information was given to Haftar. Since December 2015, Rome has staunchly supported the GNA and, thus, the Italian government and Haftar are opposed. A belief held by many in Italy is that while Haftar has a role to play in military operations against extremist forces such as Islamic State and other extremists, Haftar is not the solution to Libya’s political crisis. To be sure, Rome is not interested in seeing Moscow and Cairo work together to establish a secular authoritarian strongman in Cyrenaica, but has instead lent its support to UN-backed efforts aimed at installing a democratic government in Libya which includes certain actors deemed “terrorists” by Tobruk, Cairo, and Abu Dhabi. Second, Saudi Arabia is gumming up Haftar’s bridge-building with tribes and other notables. For the past two months, Saudi clerics have been making their way to Libya and joining up with forces behind Benghazib Brigades (BDB) and giving support to the Libyan Mufti of Tripoli, the insane ‘Ayatollah’ Sadiq al-Ghariani. Last year, the Saudis supported Salafi fighters from Benghazi who fought alongside Al-Bunyan al-Marsus, the Misrata-based group who launched the successful attack to oust Islamic State from Sirte. Clearly, the Saudi Kingdom is swinging around to the American position against Haftar. What Saudi has done has considerably complicated the situation on the ground, angering their allies Egypt, UAE, and Russia. Russia is playing it cool working all sides to maximum advantage; to be expected. The Kremlin, while entertaining Haftar on numerous occasions especially on the deck of the Admiral Kuznetsov, Moscow is also wooing the GNA so-called Prime Minister Fayez Seraj. This fact is making Europe and the US nervous. The Kremlin’s ability to support the eventual winner in Libya will mean that no matter what occurs, Moscow wins. 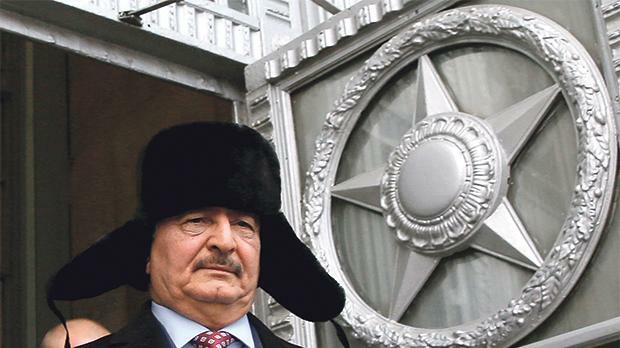 The Libyan press itself is going into overdrive on Haftar, claiming that the Field Marshall was in Moscow while meeting with Warfalla tribesmen. Now Russian special operations forces and drones are at Sidi Barrani in the West Egyptian desert. There is no doubt that the most grievous lapse of judgement on Haftar was by the Trump administration. While launching appropriate and thoughtful assaults against both AQAP in Yemen and Islamic State in the Levant since his inauguration, the President did nothing about Libya but stick to old sophomoric, academic Obama policy. The US, which is now instituting extreme vetting and is likely to pass legislation branding the Muslim Brotherhood a terrorist organisation, is supporting Tripoli’s Islamic deviants. Ironically, the Trump administration is thus embracing the radical Islamists that it seeks to eradicate. The US has made a fatal mistake in its accusing of Haftar with overtly siding with Russia just when the US may need Russia in fighting Islamic extremists in many countries. It is contradictory and sickening that White House senior advisor Stephen Bannon is not winning this fight in the White House. I beg to disagree with the detail where some people infer a decrease in tribal support for Haftar. I believe a loss of tribal support for Haftar is not what is exactly happening, quite the opposite. For example, there was recently a large meeting of the Harabi tribe in the east. The Harabi tribe represent six of the 12 major tribes in Libya. The meeting was held in Benghazi and it concluded that greater support should be provided to the LNA by recruiting even more tribesmen. Another example are two statements by the Mshait tribe controlling the area between Benghazi and Ajdabia, and by the Fwakher tribe that control south of Ajdabia, Suluq, Silk and the open area until Julu town. Both tribes confirmed their complete support to LNA and their rejection of the BDB and GNA. The Fwakher tribe even urged the House of Representatives to designate the Libya Muslim Brotherhood as a terrorist group, as the Egyptians and Emirates did. Another major tribe named Drasa issued a separate statement with a similar message. This tribe’s children represent many of the pilots and technicians in the Libyan Air Force. The Drasa tribe lost three of its members when BDB targeted their helicopter in the desert near Almabrouk oil field. A video showing Col Sharkasi, the BDB commander, saying “Allahu Akbar” next to these dead pilots was considered a disgraceful and dishonourable humiliation against the Drasa tribe. Warfalla tribe is the biggest tribe in Libya located in Bani Walid and Sirte area; the Warshafana tribe is the second largest in the area located to the south-west of Tripoli. Both tribes are from the west of Libya and both are against Islamist extremists. Magharaba is one of the biggest of the six tribes in the east of Libya. The importance of this tribe is that it is located in the Oil Crescent area and Ajdabia. It is also the tribe of Ibrahim Jadran who is allied with BDB. The tribe earlier said the Jadran is not of its members anymore, which is a tribal procedure taken against those who do not obey the tribe elders. Technically it means that if he is killed, the tribe will not claim revenge for him. Believe me this is scary indictment in a tribal community. Richard Galustian is a British political and security advisor based in MENA countries for nearly 40 years.